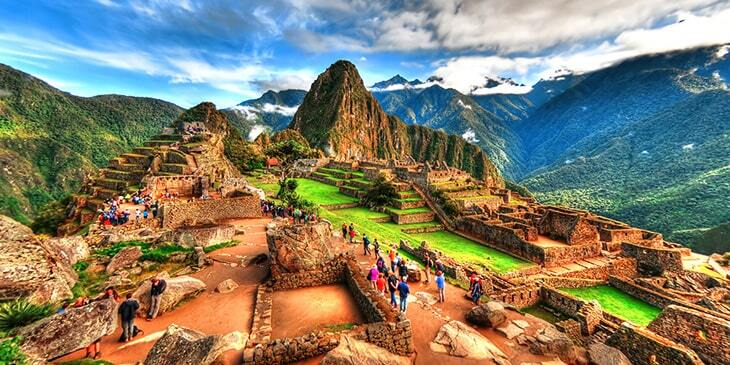 Book cheap air tickets to South America with Brightsun Travel. Call 0124 416 3000 now! South America is a magnificent continent with stunning mountainous regions, giant glaciers, unique trekking trails, medieval cities, diverse cultures and sacred sites. There are so many opportunities for exploration and fun in South America; Enjoy polo at Puesto Viejo in Buenos Aires, attend Salsa classes in Colombia, visit the beautiful beaches of Rio de Janeiro or explore the Cotopaxi National Park in Ecuador to encounter different species of hawks, condors and weasels. South America also offers various thrilling activities to its visitors… Popular ones include the classic Inca Trail to Machu Picchu in Peru, kayaking around Brazil’s Pantanal wetlands and speed boating under the country’s Iguazu Falls, scuba-diving in the Galapagos Islands, mountain biking on the North Yungas Road in Bolivia and trekking on the Perito Moreno glacier in Argentina - these are all surreal travel experiences! Brightsun Travel offers a range of cheap air tickets to South America, taking you to the heart of this epic continent and its diverse destinations. Rio de Janeiro is a glorious South American destination and one of the world’s most beautiful cities, famous for its golden beaches, lush mountains and samba-fueled nightlife. The best experience here is the cable car ride to the top of the Sugar Loaf Mountain, which offers for panoramic views of the city. Another popular South American destination is Bogota, Colombia’s capital which is a colourful arts and culture hub and a mecca of colonial and modern architecture. Another superb South America destination is the Argentina capital Buenos Aires; here you can visit the Museum of Fine Arts to explore several paintings, tapestries and carvings or head towards the San Telmo Market to browse a variety of antiques and artworks. Then there’s Lima, Peru’s vibrant capital home to lush green parks, fascinating museums and stunning palaces. Whilst in Peru, you should definitely venture out to visit the UNESCO-listed ancient settlement Caral, one of South America’s oldest archeological sites with several ancient artifacts. Brightsun Travel has a range of cheap flights to South America destinations, so get booking now and prepare for the ultimate getaway.